When it comes to winter cycling, I’m no trailblazer in my family. My grandfather, who’s 84 years old, cycles year-round come rain or snow. 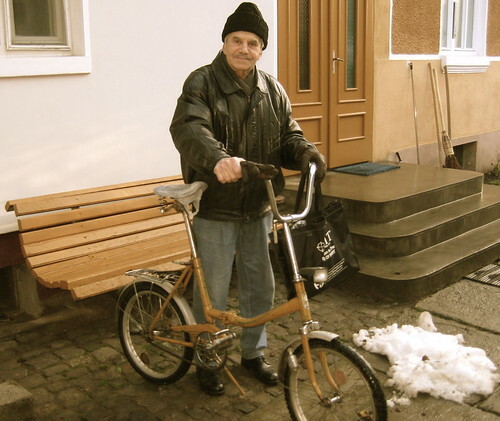 He lives in Romania (where I was born and lived when I was younger) and he has owned the same bike for as far back as I can remember. Although he owns a car, he uses his bike for everyday errands like grocery shopping, going to the outdoor farmer’s market, paying bills in town, and riding over to visit friends. He drives when needing to go to other cities but prefers to bike when simply going around town. He prefers it to walking because it’s faster and – although he might not admit this – he prefers it to driving because it allows him to hop off and say hi to people every other block. My grandpa is what one would call a ‘social butterfly’ and you can’t walk or ride anywhere with him without stopping every few minutes to greet an acquaintance or talk to a friend. In his former life, my grandfather was an accountant. 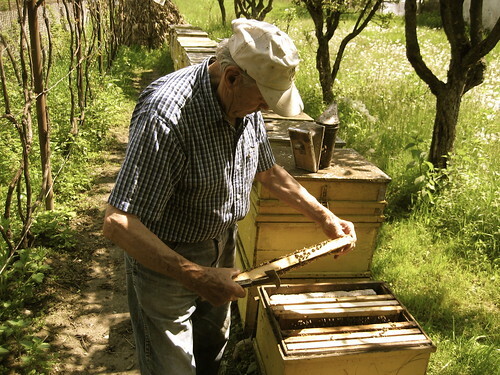 Once he retired, he simply couldn’t sit still so he took up beekeeping. He’s been a successful beekeeper for the past twenty-some years and I can only vouch for it: he produces some of the best honey in town. Some of my happiest childhood memories involve being chased by bees and chewing on honey-soaked beeswax. My grandfather has been married to my grandmother for over sixty years. He has a joie de vivre that I can only hope to have when I am their age. His has an energy that comes from having spent a life outdoors, pursuing the things that make him happy, and never letting life idly pass him by. He’s not deterred by numbers (his age, the temperature outside, the number of minutes it takes to bike rather than drive) when it comes to living in a way that feels good. I want to one day be 84 years old, still married to my best friend, hopping on my bike to ride around town, and treating each day like a chance for a new adventure. This is the best and most inspirational post I have ever read! Thank you for sharing it! This will make me smile for the rest of the day (and it is so nasty outside that some sunshine was desperately in need). What a lucky man! And what a lovely post to start the morning with, thank you! thank you for sharing! he is an inspiration indeed! Thank you so much for sharing! 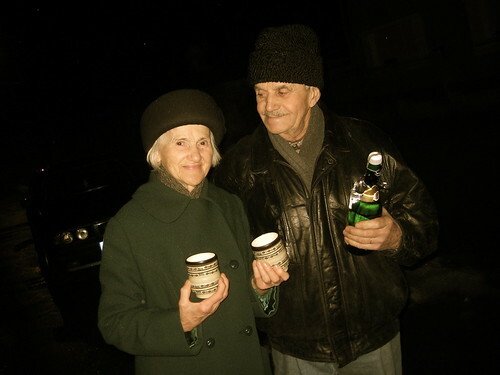 Your grandparents are ADORABLE and inspiring! Your grandparents are darling :) I would love to have grandparents who were beekeepers, as I’m a huge fan of honey! 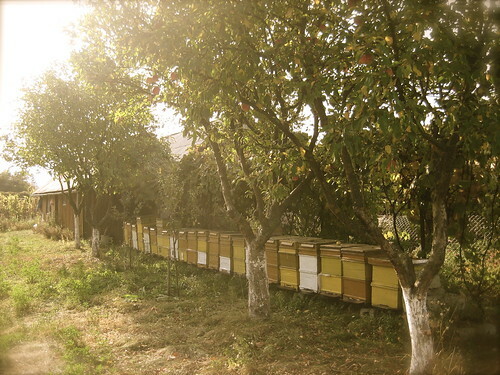 Honey and bees were very important culturally in Lithuania – the old word for friend, bičiulis (kind of a diminutive of bee), comes from the word for bee, bitė, because people used to live on homesteads with several families, and each family would keep bees, and the bees would all mingle between each family’s hives. I agree with your grandfather, numbers and statistics aren’t important if it means doing what you want. You arrange your life the way you want it, intentionally, rather than allowing life to fling you around haphazardly. And I love Le Petit Prince – great point there! Yeah, it seems to me there is way too much distraction with numbers and statistics and how certain things should be a certain way for you to be happy or content – which is something that can only be determined by each individual person, but never will be, unless they decide to look at the essential things, about themselves and other people and the world around them. I think Le Petit Prince is probably one of the most important books I’ve read (Saint-Exupery’s other books are amazing as well). We once brought back a chunk of smoked (but not cooked) pork from Lithuania, that our friends’ mom made – I totally forgot it was in the bottom of my bag when going through customs, and they didn’t find it :) I was pretty excited when unpacking! What a sweet post. Your grandpa gives us all something to aspire to. Thank you, everyone, for all your nice comments about this post! It felt very personal to share it but I’m happy to see it so well received. bees and bikes, another two of my favorite things. thanks for sharing, this is a great story of an awesome grandpa with a couple of awesome hobbies! What great inspiration — this definitely brought a smile to my face. You can feel the affection and love you have for your grandfather in this post. He and your grandmother are absolutely adorable! Thanks for sharing a bit about what makes you – you! S, what a beautiful heartfelt post. I have to say all your posts are grand, but this one is my absolute favorite. Thanks for sharing your grandfather with us. Love this post so much! Your grandparents are adorable. Thank you for going out on a limb and sharing this personal story. It is so touching. I love the way you have portrayed your grandfather’s approach to life. I hope I’m as active as he is at his age! I too can relate to the lack of interest in numbers. Even more so since I stopped being a competitive runner and can now just run or walk because I want to and just guess how far I’ve gone, but not need to time it and beat a certain time. I love it. It feels much more like me. What an inspiring and…….well, just plain happy portrayal of your grandparents! I am already a cyclist and have been thinking about taking up beekeeping. I am sure that I could learn much from your grandfather. I agree with another post which said that your description of him was like sunlight on a cold winter day. It certainly warmed my heart. We who are young or middle aged need to hear about beautiful lives like that of your grandparents; they remind us that growing old can be a wonderful adventure with unique charms and potential. Bless you for sharing this loving family portrait. Very nice! I certainly want to be that active at that age. what a nice story! love the picture of your grandfather looking over at your grandmother, what a sweet picture (get it? okay i’ll stop). Great post! 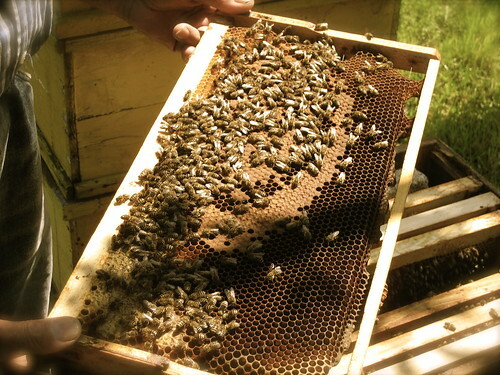 Beekeeping is on my list of things to attempt soon, but I’m impressed by your grandfather’s operation– that is a lot of bee hives! This is why I love to read blogs (and yours especially)–to get this wonderful glimpse into someone else’s life. This post was sweet and inspirational. Thanks for sharing something so heartfelt and warming. So lovely! You are so lucky to still have your grandfather – I lost both of mine in my teenage years. This post sure brings back memories. I used to have a bike like your grandfathers’ when I was in college (Groningen, the Netherlands). 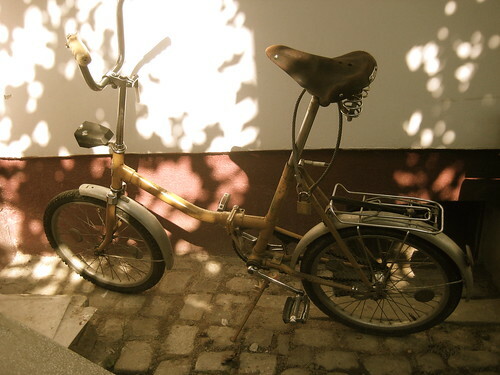 It was quite an unusual bike and I think that is why I was able to keep it for almost three years. I decorated it with lots of color and flowers in a way that was not easy to cover the decoration up by spray paint. Potential thieves probably thought twice about stealing my bike because it was so recognizable. To bad that I don’t have a picture of my “fun” bike. Your grandparents are a true source of inspiration! Thanks for sharing an amazing story! This made me cry! I admire your grandfather greatly, and completely agree with your last sentence. Beautiful! Wow! Salute to Grandpa! This blog rocks! This is a wonderful post. If I live to be 84, I too want to be happy and riding a bike. your grandfather has a beautiful attitude and is an inspiration. may we all be so lucky. Thanks so much for sharing this story, S.! It’s both wonderful and inspirational learning more about you and your family and where you’re love of biking comes from! What a beautiful tribute to your grandfather. This post is so touching, and it makes me think of my own grandparents and my own family and what they have done in their lives and what kinds of people they were. I’m terrible at writing comments on posts like this (it’s an odd, but totally welcome break from the “I love your outfit” comments that I seem to write when I’m doing my blog reading), but suffice it to say that I adore this post, and won’t be surprised if I come back time and again to read through it and feel nostalgic for my own grandparents. Love this post. What a special man. beautiful! thanks so much for sharing this sweet post. :) we’re starting to raise bees this spring and are so excited and happy about it! Mi-au dat lacrimile citing acest post, mi s-a facut dor de bunicul meu care, desi nu crestea albine si nu mergea cu bicicleta, avea aceeasi dragoste de viata ca si bunicul tau. Ii doresc multa sanatate!